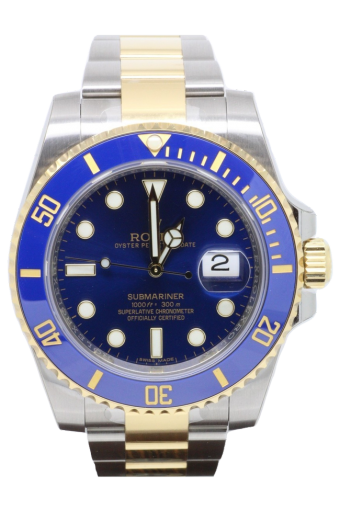 This stunning pre owned Rolex Submariner 116613 ln is the classic divers watch complete with a date function. The 40mm watch case is a steel with 18ct yellow gold crown and rotating bezel.The oyster bracelet is 18ct yellow gold and steel whilst the dial is classic blue to match the bezel inset. The Cheshire Watch Company are supplying this watch complete with all boxes and paperwork which is dated 2014.